Since I have decided that regular college is just NOT for me, I stopped attending to classes and now just concentrating on my cosmetology license and my ART. I decided to just STOP procrastinating and just draw to get back into it, so my good friend Nick wanted me to draw up these lyrics for him in script lettering. Script Tattoo Lettering "We Can Pretend We Don't Envy The Dead"
Nick absolutely loved it and is planning to get it tattooed on his side. I wish I knew how to tattoo already but just dont have the time or money to do an apprenticeship. I found a picture of some lettering I did in middle school, lol I thought it was funny to think that I even drew lettering when I was younger. Here is Nick and I at a fashion show back in April. He is actually working on this fashion show that we will be showing this next saturday. The Theme is "Cities of Night" and we will be featuring fashion and hair of London, Tokyo, Milan and I forgot the other one. LOL I am not going to be a model this fashion show, but I am going to be a makeup artist concentrating on the LONDON look. I love London, although I have never been there. I wanted to move there to attend Fashion school and explore the culture when I was younger. I will be posting more on that later! Since I completed Nick's drawing, everyone is now wanting me to draw up their tattoos for them, so I have alot of requests that I need to get going on. I am off to get ready for the day and run around and run some errands. Becoming the person that you want to be is a lifelong journey. Everyday we should learn something new about life, and about ourselves. Some people choose to value who they are by the pursuit and acquisition of material things, instead of trying to gain and pass qualities to others that will last for generations to come. Being everything that you can be involves the pursuit of becoming better than you were the day before. Make a pledge to seek wisdom, to be helpful, respectful, and reliable to those around you, not only for good karma, but to also be a great example of what a person should be to those around you. Be a person of compassion, of motivation, and determination. Set goals for yourself and accomplish them. Go for your dreams, and inspire others to go for their dreams as well. 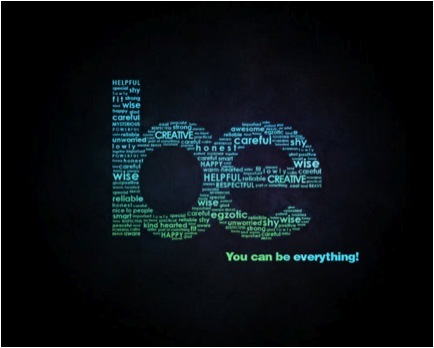 Be, because you can be everything, and anything that you set your mind too. Most importantly, be yourself!